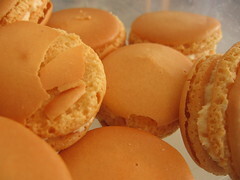 Mango Macarons with Blood Orange Buttercream - Do You Know The Muffin Man? Notes: Using the gingerbread macarons recipe as a base, I omitted all the spices and molasses, replacing them with 4 tablespoons of mango powder. My oven racks were in the wrong positions, so the cookies browned too quickly, resulting in a very chewy macaron. I piped them too large (again) as well. For the filling, I made three-quarters of a recipe of the Not-So-Classic Buttercream from The Dessert Bible (it doesn't use a sugar syrup, merely heating the egg and sugar mixture), adding about 1/3 cup of reduced blood orange juice, additional sugar and a squeeze of fresh lemon juice. The resulting cookies weren't all that great. The exterior of the shells were brittle, while the bases were hard and no detectable mango flavour. You can taste some tanginess in the buttercream, but now I have a big bowl of leftover frosting.